Citation: Feng H, Zhang Q. Legitimization Communication Tactics of Environmental NGOs in China: A Case Study of Greenpeace. Global Media Journal 2018, 16:31. In the authoritarian state of China, non-governmental organizations (NGO) are consistently exposed to the issue of legitimacy in legal and institutional systems [1,2]. Compared to China’s grass-rooted NGO, international non-governmental organization (INGO) receives more scrutiny from Chinese government and the ruling party: on the one hand, the slowprogressed regulation and policies create substantial hardships for INGO registration and operation ; on the other hand, the accelerating legislation since 2004 renders a great number of INGOs “illegal”1. Amid China’s increasing distrust towards INGO and a growing fear of foreign threats to “national security”2, INGO faces a double legitimation dilemma on Chinese soil: the first dilemma is involved with the intrinsic vigilance the authoritarian government holds against “non-government” ; the second dilemma touches on the ideological divergence between a socialist country and “Western values” . As regards the interaction between China’s contemporary social organizations and the government, the scholarship has attempted to construe the processes from two perspectives: the civil society perspective  and the corporatism perspective . Both perspectives focus on how the organizations employ political opportunities to promote activism goals without an adequate concern for ideological context. The critical discourse analysis (CDA) approaches the legitimation issue with a concern for socio-political context centrally including power relations and ideologies [8,9]. Therefore, this study adopts the CDA approach to examine how the legitimacy of INGO carried out on Chinese soil is discursively constructed amid double legitimation dilemma. Especially, the focus of the study is on environmental INGOs operating in China due to the fact that environmental INGOs have enjoyed the fastest growth among all social organizations in the past years and have allegedly become the most influential among all NGOs . According to a 2018 report revealed by China Development Brief (CDB)3, the number of environmental INGOs has increased to 72 and comprises 25% of the total number INGOs operation in China, which is highest in all types? It has also increased by 2% compared to a report released in 20174. Hence, this study argues a focus on environmental INGOs will reveal new and nuanced findings due the “rich and successful” legitimation experiences they have displayed. 4) 1992 to present. Along with China’s entering in WTO, INGOs started to experience fast-paced development and extend the focus from education, charity to environmental protection, domestic violence, social equality, and so forth. This study proposes a fifth stage beginning with the year 2004 to present. In 2004, “color revolution” broke out in the former Soviet republics Ukraine and Georgia and Beijing administration alleged a pioneering influence of INGOs in this “revolution”, especially Albert Einstein Institution and its supporting foundations. After this, China accelerates the legislation of INGO and in 2016 passed China’s Overseas NGO Management Law, one that is viewed as “the culmination of China’s long-standing distrust of foreign NGOs”6. The new law took effect in January 1 of 2017 and requires INGOs to register with Chinese police and the Ministry of Public Security before beginning operations. This was considered by Western governments and rights advocates as “a move to restrict the already tight space for NGO operations”7. Media plays an important role in discursive construction. In line with the Neo-Authoritarianism proposed by Karmel , China’s media system has experienced huge changes in the past decades, transforming from pure propaganda tools to an aggregate that combines multiple functions of publicity, culture, economy and social services (Winfield and Peng, 2005). But as the so-called “Chinese Party Publicity Inc.” , the traditional media holds a vigilant attitude towards non-governmental social actors. In such circumstances, the booming Social Networking Sites (SNS) offers alternative discursive resources . Infact, ever since 1999, China’s NGOs have been actively utilizing internet and social media for legitimation and activism goals . Sina Weibo (Weibo) is one of the most popular social media that has dominated China’s microblog market since 2009 . The number of Weibo users enjoyed an explosive growth in 2010, in which year, the degree of breadth and depth Chinese netizens got involved in social public events and public policy also reached an unprecedented level . Due to its decentralization function in information communication, Weibo significantly extends the discursive space for social organizations in an “Enlarged Media Ecology” . As of Feb 8th 2018, all the environmental NGOs operating in China that are included by China Development Brief (CDB)8 had opened Weibo accounts. The concept of legitimacy originates from the sociologist Weber  for whom it meant the acceptable exercise of power. Suchman  points out that legitimacy is tied to socially construct system of norm, values, belief and definitions, which can be regarded as a feature of individuals or organizations. The legitimacy of an organization has been described as a set of normative criteria that the organization meets in society . Organizational legitimation is the process in which legitimacy is built and maintained [19,21,22]. Researchers see this process as twofold, including organizational reforms to convince different “social constituencies of legitimation”  and legitimation communication within discourse (esp. speech and text). There are many ways to conduct organizational discourse analysis [24,25]. The CDA draws from post-structuralist discourse theory, and it utilizes methodologies developed in applied linguistics . In CDA, discursive events are seen as being simultaneously pieces of text, instances of discursive practice, and instances of social practice. Discourses are linguistically mediated constructions that sustain and reinforce ideologies . It offers empirical tools to examine the relationship between legitimacy and specific discourses . In line with this thinking, Van Leeuwen  introduced a framework of four legitimation strategies that elaborate how discourse construct legitimation for social practices and for public communication. These strategies are authorization, rationalization, moral evaluation and mythopoesis, which are further divided into sub-strategies and minor categories. Although van Leeuwen’s framework is highly elaborate and operational, researchers have found space for modification and redefinition. Halme  identified an overlap of rationalization and moral evaluation in a research on project discursive construction. Joutsenvirta  identified new discursive legitimation strategies based on van Leeuwen’s framework in a study on firm–NGO relationship. Mirhosseeini  added minor categories to the major category of moralization in a discursive analysis of a war speech. The scholarship has approached the legitimacy issue of Chinese NGOs from combined perspectives of political opportunities and discursive opportunities. The study of Zeng, et al. examined the important role of mainstream media in resource mobilization in environmental social movements. Through an invest in media authority, the movers employed “Policy Window”  to realize activism goals. The “empowerment” function of traditional media is also identified by Luo . In her study of a Chinese grass-rooted animal protection organization, Luo utilizes “strategic framing” theory and identifies a frame transition from “civil society” to “food safety” over time, the effects of which deconstruct the underlying conflict with the local government. A comparison of the studies by Zeng  on Chinese grass-rooted environmental NGO “Friends of Nature”  and Huang  on a grass-rooted charity organization “Love Save Pneumoconiosis” (LSP) reveals a narrative transition from “heroism” to “humanizing”, which cancels the opposite stance NGOs hold against the government. Gleiss  pays attention to discursive struggles by LSP and found the activists’ discourses are depoliticized expressions that avoids mentioning the government’s inaction and institutional flaws. A review of these studies shows a growing interest in discursive construction by NGOs in Chinese context. There are three findings: the framing theory is currently the most employed framework by researchers; a de-politicization strategy or the socalled “minimal politics” strategy as defined by Gleiss  both in discourse and action is widely perceived; there is scant literature on INGOs operating China, which is mostly focused on the INGO regulation and legalization. In brief, the issue of INGO discursive legitimation on Chinese soil, which shapes the specific genre of this study, is void. This study posits that an ideological dilemma adds to the INGO discursive struggles and a study on its effects will consequently add to the conceptual and empirical dimensions of existing NGO literature. Q1: What are the discursive strategies used to construct the legitimacy of INGOs on Chinese soil? Q2: How do these strategies develop at a longitudinal dimension? Q3: Do INGOs and grass-rooted NGOs differ at their legitimation strategies? This article is based on comparing discourse construction of the leading international environmental NGO Greenpeace (GP) and Chinese grass-rooted environmental NGO Friends of Nature (FON) through analyses of “smog” posts on their Weibo accounts from 2012-2018. The reasons are as below: in China, the environmental problems have worsened to a degree that it becomes the main motive of China’s growing social movements9; GP and FON are allegedly the most influential INGO and grassrooted NGO in China (GP has operated in China since 1997; FON was founded and registered in 1994), who share similar mission and core values of “environmental activism” and “social change”10; they are among the first NGOs to open accounts and start communication practices on Weibo; in China, the smog pollution started to catch wide attention in 2012 and has remained one of China’s most pressing environmental issues ever since. The social constituencies at play in “smog” issues include the wider public, opinion leaders, the corporates, especially those related to coal and fuel industry, the media, the central government and the local government-the central government is relatively active in smog treatment while the local government is more concerned with economic growth. It is a particularly revealing case for the research purposes of this paper. The data set of this study consist of 290 posts from GP’s and FON’s official Weibo accounts: 164 posts from GP’s Weibo account “@ Greenpeace”(from the period 2012-2018) and 127 posts from FON’s Weibo account “@FriendsofNature” (from the period 2012-2017). All the posts are obtained on Feb 2nd of 2018 by searching on the Weibo platform of the two accounts with the keyword “smog”. This study considers the conduct of reposting smog-related issues by other accounts as an integral part of the data sample based on the presumption that reposting is an alternative way of opinion expression . Overall, the chosen texts comprise a language database of 31 thousand words (Figure 1). 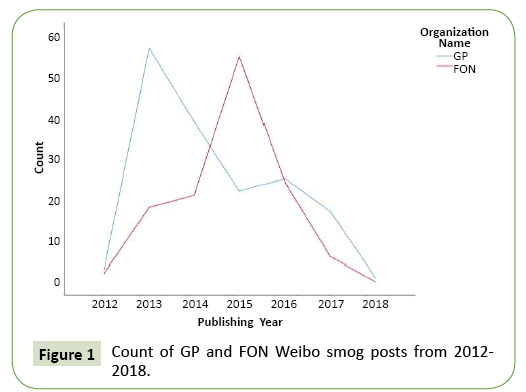 Figure 1: Count of GP and FON Weibo smog posts from 2012-2018. The framework employed in exploring the discourse of INGO is based on Theo van Leeuwen’s proposed discursive categories of legitimation. There are four major categories that include authorization (based on custom, impersonal or personal authority, or expertise), rationalization (based on the utility of institutional action and its cognitive validity in accepted knowledge), moralization (based on norms and specific value systems), and mythopoesis (based on narratives). They are further divided into sub-strategies and minor categories. The four legitimation categories are further developed and modified for the purpose of this study. A minimal politics strategy is perceived and a major category labeling “de-politicization” and subsequent minor categories are added. Under the major category of authorization, minor categories are re-categorized into grassroots, experts, media and government to match the Chinese context. Also, based on a pilot study, this study proposes the discursive legitimation endeavors by GP and FON are based on minor categories of evaluation and analogy and, to a much lesser extent, of abstraction and theoretical rationalization. The overall structure of the framework and further details including the specific conceptualization is presented in Table 1. Table 1: The five legitimation categories model. The first phase of the analysis is based on close reading and rereading of the chosen texts by two trained coders. To test their inter-coder reliability, the Cronbach's alpha is performed based on a randomly chosen sample of 30 posts. As it shows, the intercoder reliability of the five variables, authorization, moralization, rationalization, mythopoesis and de-politicization are respectively .853, .730, .754, .812, .865., which have reached acceptable levels. Then the analysis pays particular attention to the frequency of the appearance of legitimation categories of different levels at a longitudinal dimension. This is intended to answer the first and second research questions “What are the discursive strategies used to construct the legitimacy of INGOs on Chinese soil?” and “How do these strategies develop at a longitudinal dimension?”. The last stage of the analysis focuses on the differences (if any) between GP and FON on their discursive practices. An independent samples T test is performed to determine the significance of their difference level. The data analysis is performed with IBM SPSS Statistics 25. Authorization strategy provides a central means through which both parties lift their status by investing in widely accepted “authorities”. Moralization and rationalization strategies are more “subtle” and “smart” in that it hides attitudes and values in adjectives, verbs or others that connotes positive or negative inclination. Mythopoesis appeals to the SNS users and the wider public by calling on emotional resonance. De-politicization reveals the subtle relationship with the government and the ruling party. Table 2 present the frequency of the legitimation strategies in GP’s and FON’s Weibo posts during three time frames: 2012 to 2014, 2015 to 2016 and 2017 to 2018. The year 2014 and 2016 are selected to be division points because 1) In 2014, China tightened the supervision and regulation on SNS, among which Weibo, China’s biggest public opinion field, suffered a heavy setback. Many sections were shut down and numerous accounts deleted. It was considered as the end of era of “opinion leaders” and “public intellectuals”. The tightened space for “free speech” has also exerted influence to NGO accounts; 2) In 2016, China’s Overseas NGO Management Law was heat discussion. It started to take its toll on INGOs operating in China before it officially took effect in January 1st of 2017. A growing political pressure has become the underlying context ever since. In the rest of the section, this study will discuss and interpret the frequencies, the emerging patterns and how they are employed for legitimation purposes in the specific Chinese socio-political context. Table 2: Frequency of GP and FON’s legitimation strategies in numbers and percentages over time. Bold values represent frequency of occurrence ≥20%. • Please join the Smog Agent Plan that is jointly launched by Research Teams of Tsinghua University and Greenpeace. (GP, 2017). However, though there is an increasing invest in government authority, GP also increases the presence of sources from GP members at the same time, especially those with a certain degree of popularity, including entertainment stars and famous entrepreneurs. This study posits that through such a strategy, GP manages to maintain an “independent” status without appearing too “obedient” to the government. FON, however, has heavily based the discursive endeavor on authorization in the beginning. FON has a consistent percentage of authorization that is close to 20% through different time phases. This is matching for its status of “grass-rooted NGO” that seeks attention and recognition. What is noticeable is FON’s heavy investment in grassroots authority, which accounts for 63% of the total authorization frequency. • “We are proud to the model family of low carbon. We hope there many others that will follow suite and join the efforts in fighting smog,” said Ouyang Xiangping (an ordinary mother). (FON, 2017). • Talking of the good air in London, the British government has paid well to get rid of the name of “The City of Fog”; how much are we will to pay to get rid of Beijing’s smog? (GP, 2016). • To Ministry of Ecology and Environment of the People’s Republic of China: since the pollution level of smog has advanced, shouldn’t we also advance our treatment plans? • The Wuhan people say there has been incredibly heavy smog in Wuhan for two days. According to local officials, this was due to straw burning, and I believe it was due to outdoor barbecue! LOL. (FON, 2014). • Ming from a suburban a school fainted during a PE class on a smoggy morning. It is hard to conclude any direct relation with Ming’s black out and the smog. But it is fair to say the students are taking classes at the cost of their life on smoggy days. (GP, 2017). • After leaving CCTV, Chai Jing is no longer a reporter, but a mother who wishes good health for her daughter. However, her daughter was born with benign tumor and had to receive a general anesthesia surgery within hours of her birth. Shocked by harms brought by smog, Chai Jing makes this documentary in the hope of calling up more people to act. (FON, 2016). 4) The enactment of a new environment protection law. For the first three topics, two constituencies are called into supervision, the enterprises with serious pollution and the local government who cares more on economic growth than environmental protection. For the forth topic, the central government is the main interlocutor. But overall, the government is the main party to appeal to. Different strategies are employed regarding different topics which this study will discuss in details below. • The coal power plants in Beijing-Tianjin-Hebei region are still slow in reducing SO2 emissions. Who grants them the right to be “arrogant”? (GP, 2015). • Do you know that the Atmospheric Pollution Prevention Law that is in effect was enacted in 1987! Back then, the word “smog” did not even exist. Can we ask for a new environment protection law? (the central government being default interlocutor) (FON, 2015). At last, Tables 3 and 4 presents the independent-samples T test result of the legitimation strategies in GP’s and FON’s Weibo posts. They reveal how GP and FON are differed in discursive strategies at a statistical level. Table 3: Descriptive results of GP and FON’s legitimation strategies. Table 4: Differences between legitimation strategies by GP and FON (independent-samples T test). Table 3 presents the means and standard deviation of discursive strategies employed by GP and FON. Overall, GP relies more on moralization and rationalization whist FON relies more on authorization, mythopoesis and de-politicization. Combined with the results displayed in Table 4, this study finds the differences in discursive strategies by GP and FON have reached significant levels in all five variables: authorization (sig=0.000, p<0.001), moralization (sig=0.000, p<0.001), rationalization (sig=0.000, p<0.001), mythopoesis (sig=0.000, p<0.001) and de-politicization. However, it will be reckless to conclude that GP is more like a radical activist that has a relatively opposite stance against the government, or that FON focuses on grassroots and the wider public with an obedient posture to the government. Again, conclusions can only be made in the contemporary social-political context of China, which this study elaborates below (Table 4). Overall, GP adopts the major categories of authorization, moralization, rationalization, mythopoesis and de-politicization as legitimation strategies. It starts with a lesser reliance on authorization between 2012 and 2014 (8%), but changes from 2015 when the percentage reaches 12% and climbed to 19% in 2017-2018, a number that exceeds FON by 2%. GP bases its discursive endeavor most heavily on moralization with a consistent percentage of about 40% during each time phase. The moralization strategy is accompanied with rationalization. A mixed strategy of the two is heavily used by GP and the two strategies comprise 78% of the total strategies, whilst such a pattern is not observed in FON. Mythopoesis strategy is only marginally used by GP but the frequency results reveal a growing use of this strategy over time. Finally, an examination of the depoliticization strategy reveals a seemingly ambiguous result. On the one hand, GP’s uses less de-politicization strategy than FON does, which implies that GP is more like a “fearless” activist that dares to challenge the government; on the other hand, a closer examination of the specific minor strategies reveals GP adopts an undifferentiated approach that avoids direct criticisms of the local government and central governments as a whole, while FON appears blunt with the local government and cautions with the central government. Finally, GP and FON differ in their discursive legitimation strategy use in all five categories. In summary, this study proposes that GP turns from a “fearless activist” into a “mild advocate” over the years. This is especially true through a contrast with FON’s legitimation strategies. Besides, GP puts consistent efforts in emphasizing its “independence” through a mixed strategy of moralization and rationalization and has slowly learned to appeal to the wider public by an increasing use of mythopoesis. This article attempts to fill the void of the discursive research on INGO in China. Also, this study adds to the conceptual and empirical dimensions of the four legitimation strategies by Theo van Leeuwen and proves the applicability of the fifth major category “depoliticization” and subsequent minor categories of “avoidance” and “restraint” through a quantitative study. At last, this study proves the statistical differences in discursive legitimation strategy by INGO and grass-rooted NGO in China. However, it needs to be recognized that the framework used in this article is basically conceptual and discursive rather than linguistic. It does not propose specific formal lexical or structural elements that can realize the categories of legitimation. Also, this article does not assume reasons contributing to the differences in legitimation strategies displayed by GP and FON. Whether it is due to the macro-level context, especially the ideological environment, or the different positioning in organizational image by the two organizations, or others, has left for future research. 4See http://www.chinadevelopmentbrief.org.cn/news-19734.html, search date Feb 2, 2018. 8CBD was created in 1996 and registered as an NGO named “Beijing E-share Civil Society Center”. It is China’s first independent information platform on civil society, see http://www.chinadevelopmentbrief.cn/about-us/. 10See http://www.greenpeace.org.cn/about/mission/ and http://www.fon.org.cn/index.php?option=com_k2&view=item&layout=item&id=6&Itemid=171, search date Feb 2nd, 2018. Gleiss M (2015) Speaking up for the suffering (br) other: Weibo activism, discursive struggles, and minimal politics in china. Media Culture and Society 37: 513-529. Wu Y (2004) On Legal Issues of Social Organizations. Global Law Commentary 2004: 261- 262. Jin B (2009) The effects of international non-governmental orgnizations (ingos) on china (Order No. 10538582). Available from ProQuest Dissertations & Theses A&I; ProQuest Dissertations & Theses Global A&I: The Humanities and Social Sciences Collection. (1874899061). Yang G (2005) Environmental NGOs and institutional dynamics in china. The China Quarterly 181: 46-66. Liu X, Wang J (2009) The NGO Force and its Influence in Governmental Overseas Communication-an Observation on Western NGO’s Permeation Effects in China. Journalism Quarterly 1: 105-109. Saich T (2000) Negotiating the state: The development of social organizations in china. China Quarterly 161: 124-141. Ru J, Ortolano L (2007) Corporatist control of environmental non-governmental organizations: A state perspective. China's embedded activism: Opportunities and constraints of a social movement; china's embedded activism: Opportunities and constraints of a social movement Routledge. Rojo L, Van Dijk T (1997) There was a Problem, and It was Solved! : Legitimating the Expulsion of “Illegal” Migrants in Spanish Parliamentary Discourse. Discourse and Society 8: 523–566. Fairclough N (2013) Analysing discourse: textual analysis for social research. Revista Comunicación Y Medios 14: 206-207. Zeng F, Dai J, Wang Y (2014) The Political Opportunities of Media Use and Environmental Fights-A Case Study of Anti-Nuclear Event. Journal of China University of Geosciences (Social Sciences Edition) 14: 116-126. Karmel SM (1995) The neo-authoritarian contradiction: Developmentalist dictatorships and the retreat of the state in mainland china (Order No. 9528930). Available from ProQuest Dissertations & Theses A&I; ProQuest Dissertations & Theses Global A&I: The Humanities and Social Sciences Collection. (304222814). Lee C, He Z, Huang Y (2006) Chinese party publicity inc. conglomerated: The case of the Shenzhen press group. Media, Culture & Society 28: 581-602. Huang D (2017) Social Media and Legitimation Tactics of Grassroots NGOs in China: A Case Study of Love Save Pneumoconiosis. Journal of International Communication 39: 42- 62. Liu J (2011) Picturing a green virtual public space for social change: a study of internet activism and web-based environmental collective actions in china. Chinese Journal of Communication 4: 137-166. Peng L (2014) From Online Media to Online Society-The Advance and Extension of China’s Internet in 20 Years. The Journalists Monthly 6: 12-15. Xie Y, Xu Y (2011) The History, Current Situation and Development Tendency of Weibo. Modern Communication. Journal of Communication University of China 4:75-80. Qiu L, Chen T (2011) A Research on New Media Events, Beijing: China Renmin University Press. Weber M (1978) Economy and Society: An Outline of Interpretive Sociology. Univ. of California Press. Suchman MC (1995) Managing legitimacy: strategic and institutional approaches. Academy of Management Review 20: 571-610. Atack I (1999) Four criteria of development ngo legitimacy. World Development 27: 855- 864. Phillips N, Lawrence TB, Hardy C (2004) Discourse and institutions. Academy of Management Review29: 635-652. Vaara E, Monin P (2010) A recursive perspective on discursive legitimation and organizational action in mergers and acquisitions. Organization Science 21: 3-22. Reus-Smit C (2007) International crises of legitimacy. International Politics 44: 157-174. Alvesson M, Dan K (2000) Varieties of discourse: on the study of organizations through discourse analysis. Human Relations 53: 1125-1149. Grant D, Hardy C (2004) Introduction: struggles with organizational discourse. Organization Studies, 25: 5-13. Foucault M (2002) The essential works of Michel Foucault, 1954-1984. Allen Lane The Penguin Press. Giddens A (1986) The constitution of society: outline of the theory of structuration. Political Geography Quarterly 5: 288-289. Vaara E, Tienari J (2008) A discursive perspective on legitimation strategies in multinational corporations. Academy of Management Review 33: 985-993. Van Leeuwen T (2008) Discourse and practice: new tools for critical discourse analysis. Discourse & Society 39: 122-125. Halme J (2017) Discursive construction of the legitimacy of a place marketing project: the case of north karelia. Journal of Place Management & Development 10: 61-72. Joutsenvirta M (2011) Setting boundaries for corporate social responsibility: firm–ngo relationship as discursive legitimation struggle. Journal of Business Ethics 102: 57-75. Mirhosseini SA, Mirhosseini SA (2017) Discursive double-legitimation of (avoiding) another war in Obama’s 2013 address on Syria. Journal of Language & Politics 16: 706-730. Kingdon JW (2006) Agendas, Alternatives, and Public Policies (Longman Classics Edition). Peking University Press. Luo X (2017) Integration and Contention: An Analysis of Movement Frame of “Anti Dog Meat Festival” Movement. Youth Research 3: 82-93. Zeng F (2007) The Issue Construction and Public Expression of Environmental NGO-A Case Study of “Antelope Protection” Movement by “Friends of Nature”. Journal of International Communication 10: 14-18. Li J, Xie Y (2018) A Study on Social Media Communication Practices of University Students-Based on a Quantitative Analysis of Ten Universities in Shanghai. Shanghai Journalism Review 1: 90-96.